Iowa and nine other states are involved in the development of the Mississippi River Trail (MRT), which extends from the headwaters of the Mississippi River in Minnesota to the Gulf of Mexico. 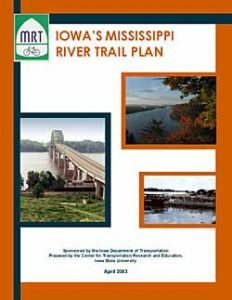 This project developed a concise and specific long-range plan for the development of the Iowa portion of the MRT between New Albin and Keokuk. This includes an overall vision and concept plan, proposed trail route locations, implementation plan, and evaluation of the economic, social, and cultural impacts of the MRT plan. The MRT in Iowa will provide safety, economic and recreational benefits.